Acupuncture and Chinese herbal medicine provide fast and effective relief for stress management and energy enhancement; additionally we offer classes in medical Qigong (energy skill). Greg has been studying and practicing various forms of meditation and Qigong for over 30 years; he is a certified teacher of Zen meditation. 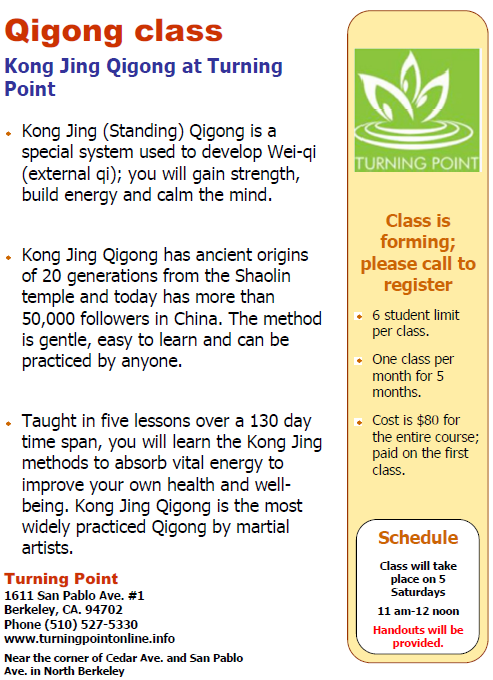 "A compelling body of research emerges when Tai Chi studies and the growing body of Qigong studies are combined. The evidence suggests that a wide range of health benefits accrue in response to these meditative movement forms, some consistently so, and some with limitations in the findings thus far. This review has identified numerous outcomes with varying levels of evidence for the efficacy for Qigong and Tai Chi, including bone health, cardiopulmonary fitness and related biomarkers, physical function, falls prevention and balance, general quality of life and patient reported outcomes, immunity, and psychological factors such as anxiety, depression and self-efficacy. A substantial number randomized controlled trials (RCTs) have demonstrated consistent, positive results especially when the studies are designed with limited activity for controls. When both Tai Chi and Qigong are investigated together, as two approaches to a single category of practice, meditative movement, the magnitude of the body of research is quite impressive."